Awnings offer solar protection and create the utmost privacy for you. Shade plus is a fantastic addition for anyone looking to extend their shade options. With multiple control options you can operate your awning how you please! 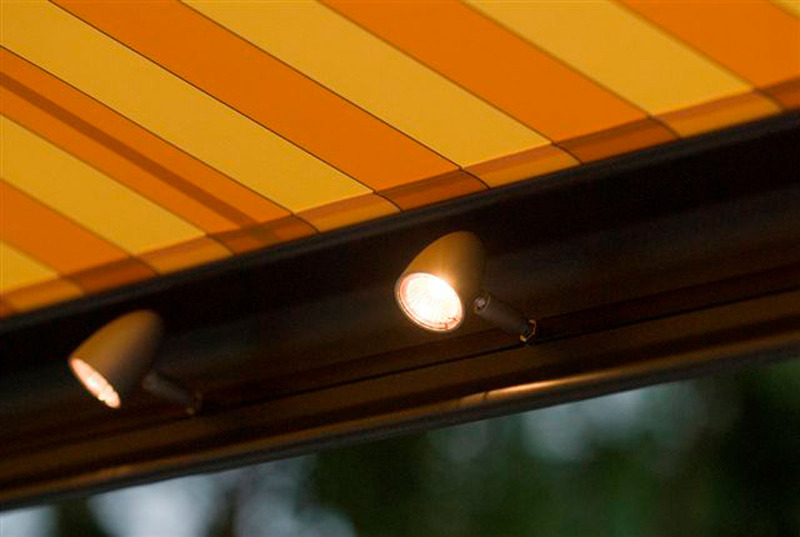 Add spotlight or LED lighting to your awning to make your summer evenings last longer. Enjoy the evenings by adding heater options to your awning. 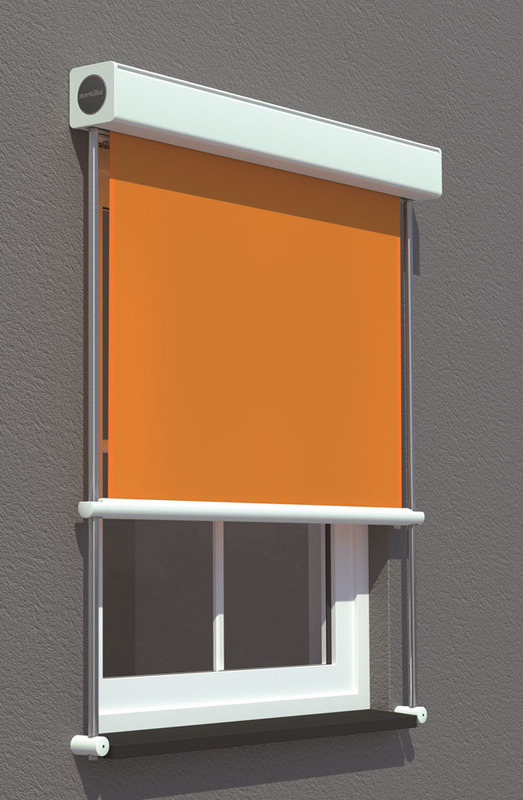 Markilux external blinds are a great solution for anyone wanting external sun protection with limited outdoor space. 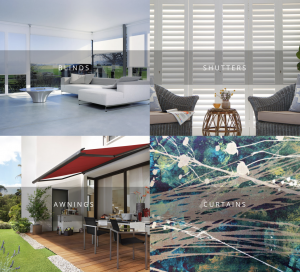 15% off Markilux awnings until 31st July! 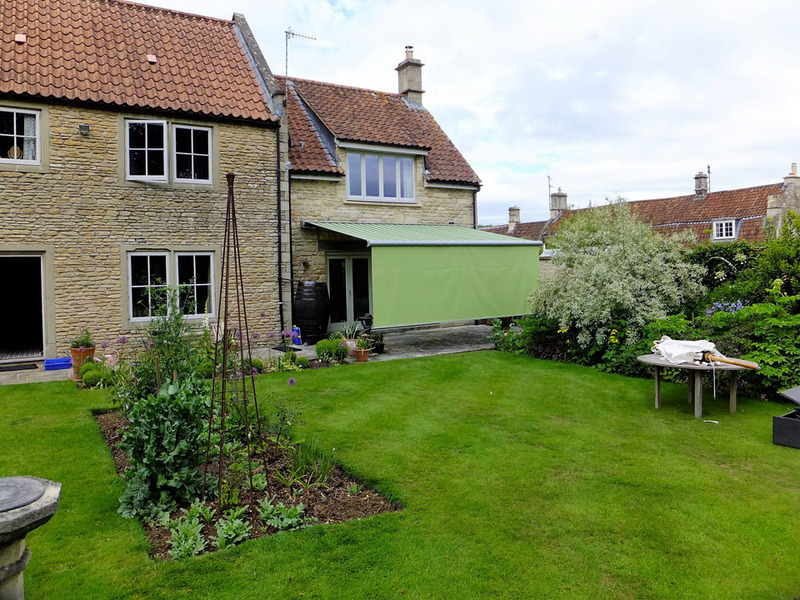 Thinking of investing in an awning for your home? 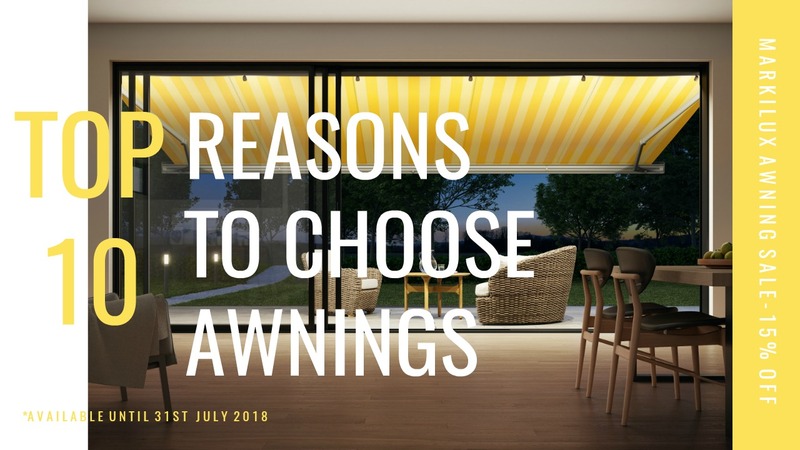 Whether you are thinking of patio awnings or external blinds our top 10 list of reasons for owning an awning will convince you why they are the perfect addition to any home! Read our list below. Awnings are superb at providing solar protection. Their specialist fabric reflects harmful UV rays and creates a safe shaded area in your garden or patio. As well as creating shade, patio awnings are great for privacy. You can establish a private space in your garden at anytime. 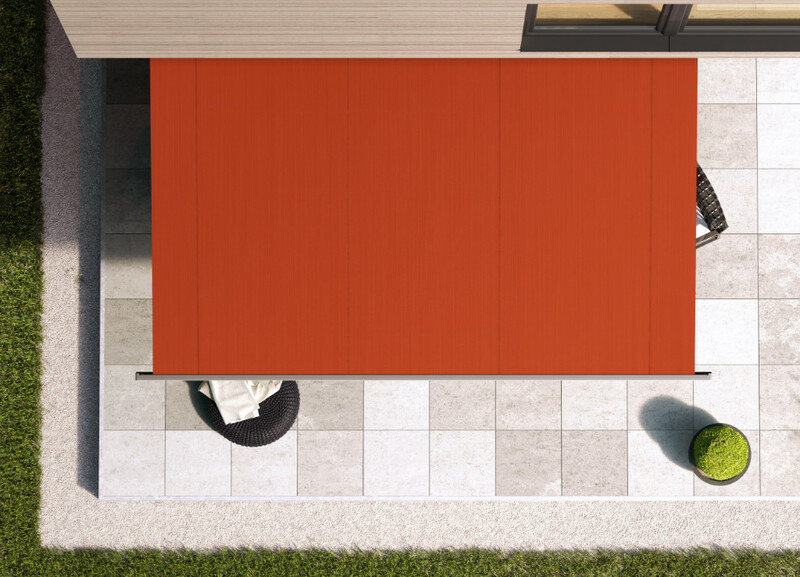 Markilux also offers the shade Plus option, where an additional screen lowers from the front of the awning to create a personal and peaceful environment to relax in. Available in lots of modern and traditional designs, including the classic striped awning design, awnings can compliment your home very nicely. By also being fully retractable, they can slot away very neatly and remain totally unobtrusive when not required. With multiple control options, owning an awning has never been more convenient. Simply operate your awning with a Markilux remote or add it to your home automation system and set your awning to match the weather! Why not add spotlights or LED lighting to your awning and enjoy the summer evenings for longer? The lighting features sit discretely in the awning design and can be turned on or off at the press of a button. As the sun goes down, you can still take advantage of the Summer weather with these helpful lighting options! We all love being sat outside in the summer evenings enjoying the ambiance but when the sun goes down it can start to feel cooler. 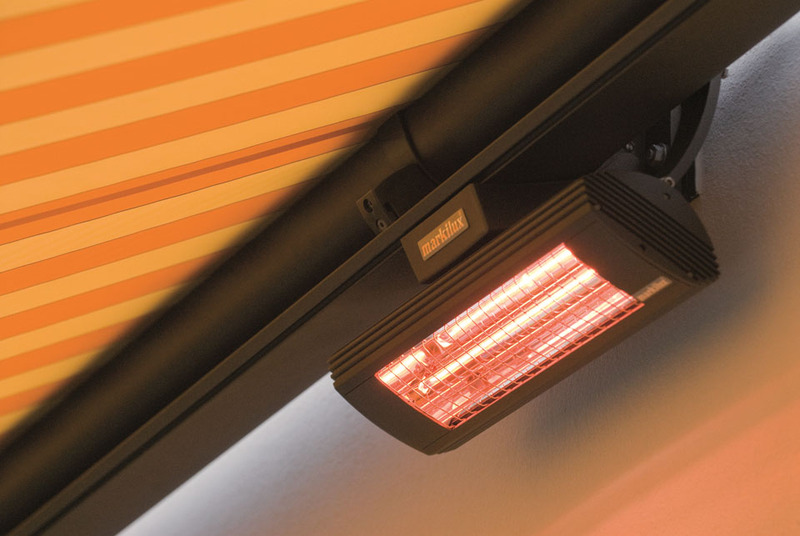 By adding infra red heaters to your patio awning, they emit a comfortable heat which lets you stay outside for longer and extends your Summer. Markilux have developed advanced awning fabric that self cleans in rain. The fabric has a transparent waterproof layer that lets the rain clean the material while also remaining impervious to weather. This means patio awnings can take care of themselves and less hassle to maintain for you! 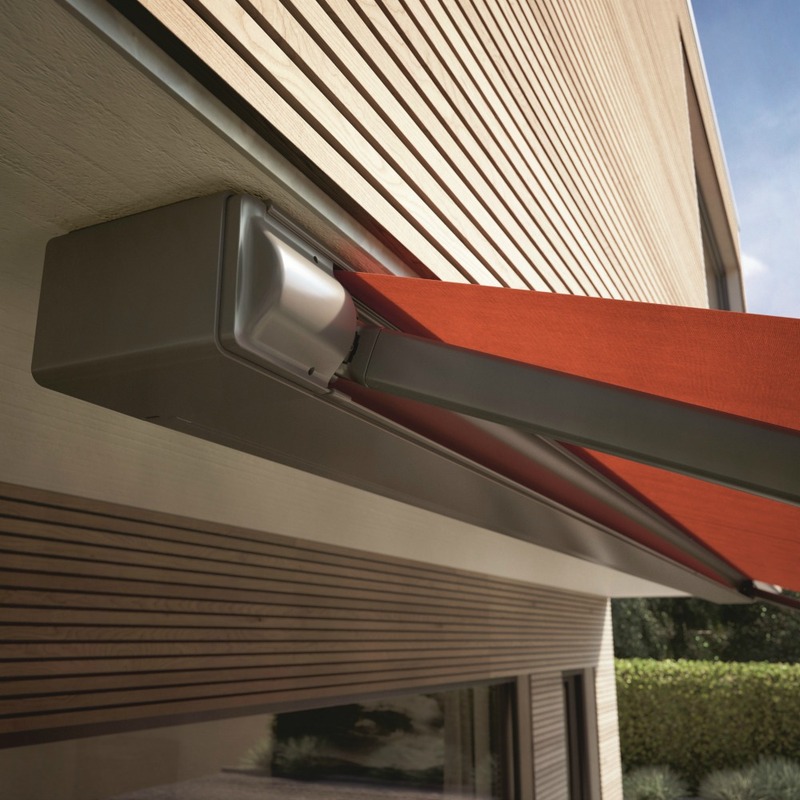 For those with limited outdoor space, Markilux offers unique external blinds. External blinds were developed to work with high rise apartments and sit vertically across the windows. These blinds offer as much sun protection and privacy as the traditional awning model but work extremely well in a reduced external window space. Markilux understands that their patio awnings need to withstand exposure to extreme elements throughout the year. With this in mind they have designed their awnings to last. Their awnings are made with a combination of German engineering, robust materials and solid frames, designed and tested to withstand varying weather conditions. 10. 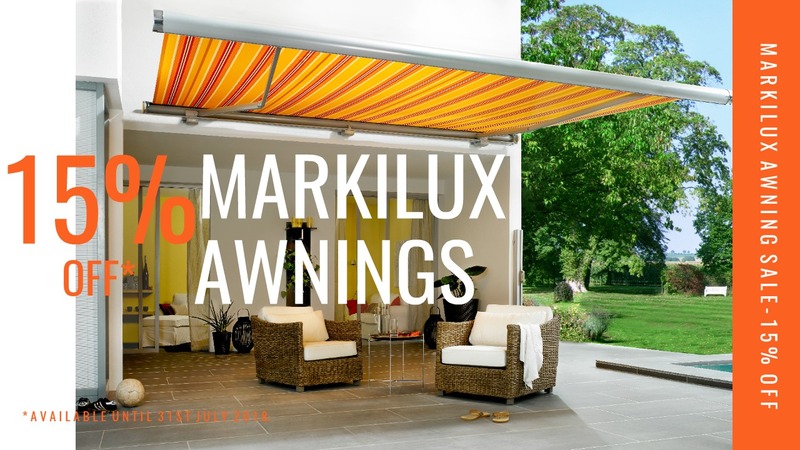 15% off Markilux Awnings right now! With the Markilux Awning Sale now on its the best time to invest in awnings! If you would like to know more about patio awnings or the Markilux awning sale you can contact us. We offer a free design and on site measuring service where we provide technical advice on our awnings and can give you a non obligation quote. We also provide awning installation services. Visit us at our showroom in Bath to browse our awning display!